The GCBO does not regularly buy land to keep. We utilize a unique land acquisition strategy you can learn more about by clicking the links at the bottom of this page. However, we do own conservation land at our Headquarters in Lake Jackson, Texas and on nearby Quintana Island. 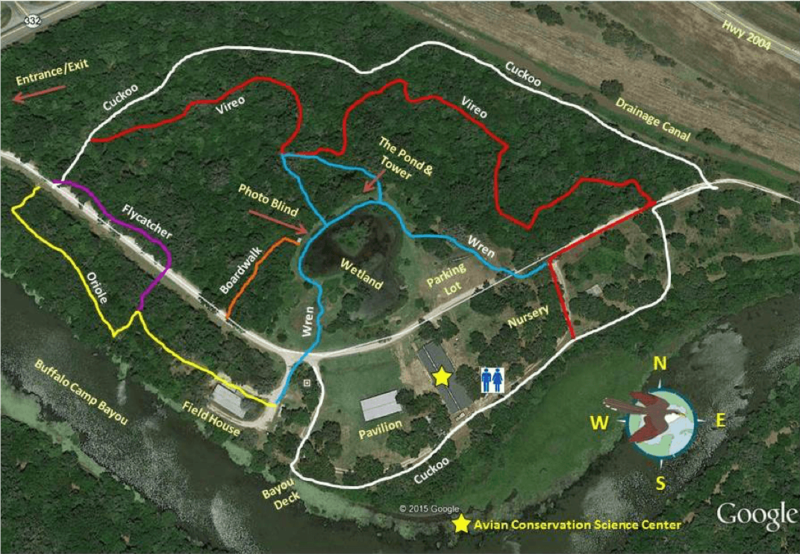 Our headquarters sits on 34 acres of bottomland forest next to the Buffalo Camp Bayou in Brazoria County, Texas. The land was deeded to the GCBO by the Dow Corporation who used it for a company recreational area. The acreage is wooded with old growth hardwood forests and riparian corridors. A wetland was created by GCBO that is now thriving. The bayou runs along the western border of the property and is connected to the Brazos River at its southern end. The property is open Mon-Fri from 8:30 am to 4:30 pm for visitors to enjoy, and there are several miles of trails to walk and bird. There is no fee to enter, but please check in at the Headquarters. 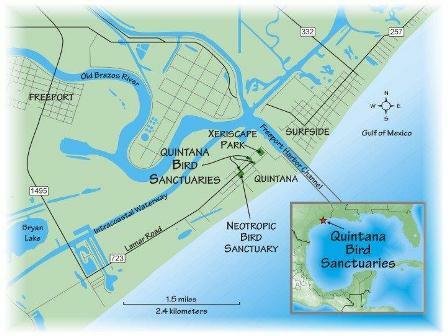 We own two small tracts of land additional adjacent to conservation land owned by the Town of Quintana, creating three migratory bird stopover sanctuaries on the Quintana Island in Brazoria County, Texas. We also hold conservation easements on the town-owned properties. These properties are all left with native coastal island vegetation and have also been re-vegged to help birds using them to rest and fuel up during spring and fall migrations. The three sites, Quintana Neotropic Bird Sanctuary, The Bird Preserve, and Xeriscape Park are all open to the public from sunup to sunset. There is no fee to enter.